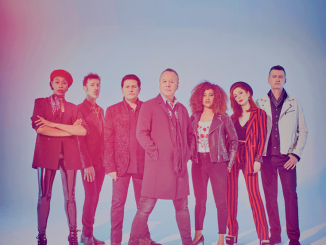 The storied band Simple Minds has been experiencing a well deserved revival. The beginning of this decade saw renew interest in the influential Scottish band with numerous critics and music aficionados giving the band’s vast discography a reassessment. Their profile has been elevated by praise from bands such as Manic Street Preachers and their being bestowed with the Q Magazine Inspiration to Music Award in 2014. Their most recent release 2014’s Big Music supported calls for a revaluation of the band’s influence. “Big Music” was a spectacular album that returned in many ways to the musical stylings that sent the band to the top of the musical stratosphere in the 80’s. The release of deluxe boxed sets for Sparkle In the Rain and Once Upon a Time along with the 2002 release of Silver Box renewed attention in the band’s stellar works. These band approved box sets have yielded an embarrassment of riches for both critics and fans as they flesh out in all encompassing detail the creative process of each of the albums. The much anticipated deluxe box set of New Gold Dream 81-82-83-84 is being released on July 29 and is as extraordinary as the prior remastered box sets. This release captures in 6 discs the band as they stood on the edge of international rock stardom. It documents the leap the band took from a reputation as experimental cult classicists to garnering mainstream recognition that would inspire their popular future releases. 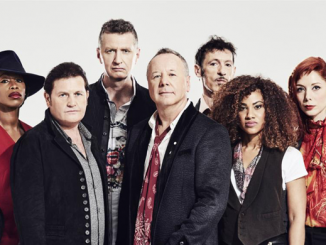 The remastering project was overseen by Simple Minds’ guitarist Charlie Burchill. The first disc was remastered at Abbey Road Studios by Andrew Walter and contains the original 9 song track list. The remaster is crisp and fresh with various lost effects come alive. The second disc contains extended remixes and instrumentals for the album singles and is the first time some have been made available to the general public. In addition the disc includes two versions of the fabled song In Every Heaven. The song had two distinctive approaches on the disc and will make you wonder how one of these versions did not make it onto the original playlist. The third disc contains the B-sides and 7” single editions which provide an insight into every permutation of the most popular tracks of “New Gold Dream”; with the instrumental Seeing Out the Angels a stand out addition on the disc. The fourth disc contains the unreleased BBC1 John Peel sessions and Kid Jensen radio sessions. To me this is the most exciting addition to the canon of “New Gold Dream”. This disc places on display the palpable electricity and energy the band was giving off in each recorded performance. It captures as much as possible the magic Kerr and Co. create in a live set. Those electric moments are like captured lightning in a bottle and truly enhance the box set’s contents. The other exciting facet to this disc is the inclusion of earlier songs such as In Trance As Mission and Sons and Fascination in rare studio performances. The entirety of these live performances displays how “New Gold Dream” was the runway for a band about to take off into their fan’s most beloved era. It becomes evident that the jigsaw pieces were falling into place at the exact time they were needed for the band. 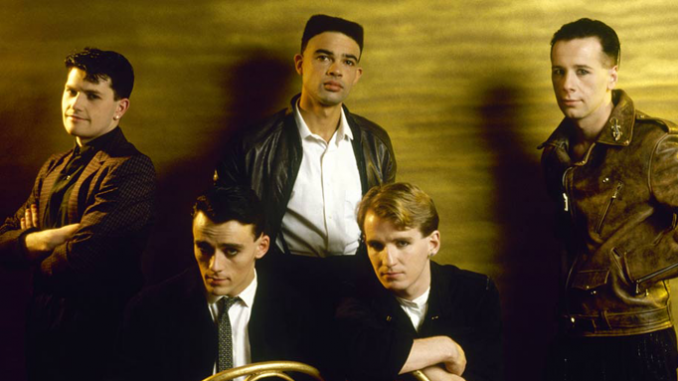 The sum of the pieces allowed the band to click with listeners delivering a splendid blend of keyboard experimentation, Kerr’s stellar vocals, and the cohesion of the band members’ musicianship; along with Charlie Burchill coming into his own as he developed the ever recognizable guitar stylings that make his work so distinctive. Disc 5 is loaded with alternative mixes and demos that place the listener in the sound booth where you can see the process that created the album. The box set is further fleshed out by a DVD 5.1 mix of the album which includes never released before promotional videos, a 36 page booklet with extensive sleeve notes and new interviews with Jim Kerr and Charlie Burchill. No stone was left unturned to make this the definitive remastered deluxe box set for New Gold Dream. For the sake of those who have forgotten or are rediscovering Simple Minds a little background is helpful. “New Gold Dream” is the band’s 5th studio album and was released in September of 1982. The album followed the twin releases of Sons and Fascination and Sister Feeling Call in 1981. In some ways those two albums completed an approach the band had followed from their inception which was to combine the Dance Club stylings of the time with experimental keyboard work. The band had been greatly influenced by their 81’ tour of Australia and were toying with new approaches and sounds for their next album. “New Gold Dream” was recorded in 5 months at The Townhouse, The Manor and Rockfield studios. The release in April of 82’ of the single Promised You A Miracle earned the band heavy radio play and an appearance on “Top of The Pops”. Immense pressure was placed on the band to not blow the momentum the single had produced. It was also at this point the band along with producer Pete Walsh decided that a change up was necessary on the drum throne. The band drummer Mike Ogletree had been floundering with the new percussion direction the band was taking and session drummer Mel Gaynor was brought in to help. Ogletree would tour with Simple Minds for a portion of the “New Gold Dream” tour and then leave the band. After his departure Gaynor became a full belted member of the band. This addition would have long term implications for the band’s continually developing sound. The band did not disappoint the listening public after the significant build up of anticipation for New Gold Dream as they delivered an exceptional album. “New Gold Dream” would go to number 3 on the UK album charts. The singles Promised You A Miracle and Glittering Prize would become substantial chart hits and the release would spend a year on the album charts. Its success was due to a combination of sophisticated pop accessibility and ebullience while the band continued to be plugged into their quirky and experimental tendencies. The songs were mystical, warm and emotional. The kick off song Someone, Somewhere in the Summertime was a wistfully romantic yearning song that held out the promise of something better waiting in the wings. The evocative beauty of the song would become a definitive trademark for the group in the next decade. Songs such as Colours Fly and Catherine Wheel, along with Glittering Prize” were lyrical poems that cemented the building popularity of the band. The tracks were filled with winning combinations of deep bass, Burchill’s emerging shimmering guitar work, Kerr’s vocal range and his flare for engaging lyrics. Other songs like Big Sleep were filled with religious symbolism and romantic melancholy which again would be reflected in later works. Also noteworthy was the band’s apt conversion of their respect for art rock pioneers Roxy Music and translating it into their own songs. Roxy Music’s fingerprints are found throughout the recording. They are most apparent when Kerr channeled his inner Bryan Ferry on Hunter and the Hunted and King is White and in the Crowd. What could have come off as hamming on Kerr’s part instead translated into effervescence and sincerity. Added to all the deep track excellence on the album were the tracks “Promised You a Miracle” and the title song New Gold Dream which are both amazing distillations of 80’s British New Wave. These are two songs that you can point to as excellent examples of what that period in popular music was about as the band rode the crest of the New Wave era. 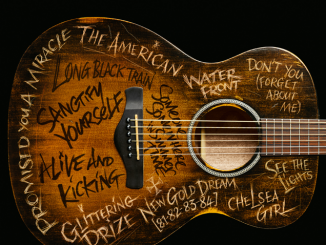 All in all the new deluxe boxed set of “New Gold Dream” is a listening opportunity that should not be missed. 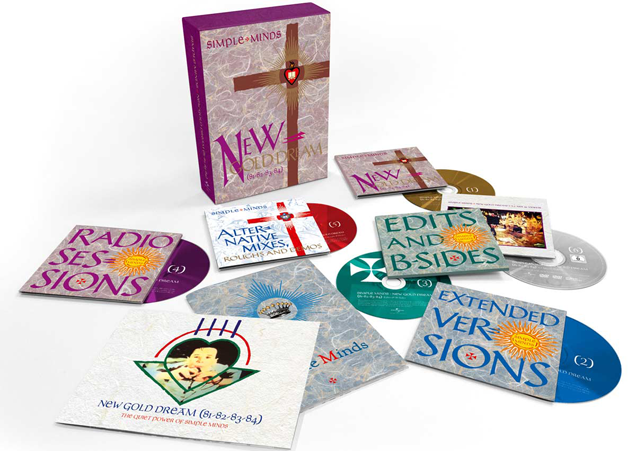 The “New Gold Dream” deluxe box set is a must for Simple Minds aficionados. If you have misplaced the original or possibly never up graded your tapes to a CD/vinyl version here is your chance to update and relive the amazing content of this album. The wonderful memories of a golden era of music will wash over you as you again experience the fantastic songs that are contained on the release. The never before available additions keep the release from becoming another rehash money grab which happens all too often with re-releases box sets. A particular “hats off” to Charlie Burchill for his brilliant job as curator of the content, he has done a stellar job overseeing each of the box set projects. The attention to detail and extraordinary inclusion of a vast amount of content bring the 80’s era in which New Gold Dream was recorded to life. Like it’s box set predecessors “New Gold Dream” is exceptionally well done and works like a time machine, full immersing the listener in that exciting period of time when the band was standing on the very cusp of stardom.